Taittinger Brut. A Champagne gift for drinking straight away. 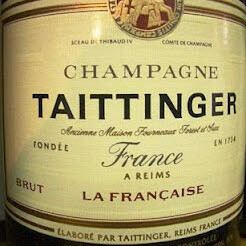 Taittinger is one of the few Champagne houses still owned and managed by the family whose name appears on the label. Made from the three classic champagne grape varieties, Chardonnay, Pinot Noir and Pinot Meunier, the high proportion of Chardonnay in the blend produces a light style with the emphasis on elegance and finesse. From the first pressing of select grapes from the finest areas of Champagne, "La Française" contains more of the costly Chardonnay grape than most brut Champagnes. Light and elegant, with subtle body and bouquet. Taittinger Brut Réserve is a blend of some 30 Chardonnay wines (40%) and Pinot wines (60%), from a number of different vineyards and matured to perfection. Such a high proportion of Chardonnay is seldom found among the great champagnes. TASTINGL: The colour is brilliant, golden straw yellow. The bubbles are fine. The mousse is both discreet and persistent. The nose, very expressive and open, is both fruity and bready. It exudes aromas of peach, white flowers (may blossom, acacia) and vanilla pod. On the palate, this lively fresh wine is at once in harmony. This is a delicate wine with flavours of fresh fruit and honey. In all a wine blessed with a well-developed aromatic potential. It is aged for three to four years in the cellars where it achieves perfect maturity. A wine of great charm, combining the power of Body and the intelligence of Spirit.